Producer of “Search” Natalie Qasabian is having quite the Sundance with her film Search going to Sony for $5 million. She sat down with her Alma Mater for 5 questions below. What kind of project you do you have at Sundance (film, interactive, short) and what is it about? This year I’ll be coming to Sundance with a narrative feature film called SEARCH which is playing in the NEXT category. 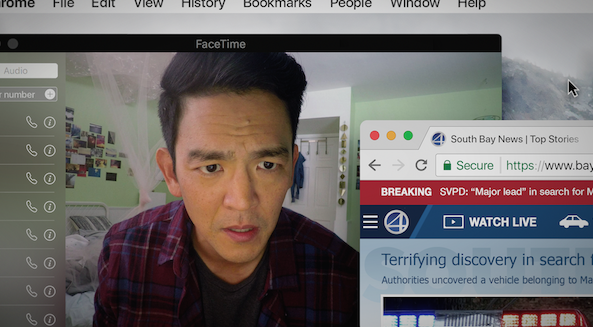 SEARCH tells the story of a desperate father who tries to find his missing teenage daughter by hunting for clues on her laptop. It’s a thriller that unfolds entirely on computer screens. How did you come up with the idea for it and what message do you hope it conveys? I didn’t come up with the idea for SEARCH but I was the first person Aneesh (Co-Writer/Director) and Sev (Co-Writer/Producer) gave the script to. At the time I was in the middle of producing a Duplass Brothers film, DUCK BUTTER, and wasn’t sure that the scheduling gods of indie film would allow me to do both projects. But as soon as I read the story, I knew I had to be a part of the project even if it made it no sense for my schedule (or sanity). I hope people who see our film walk away with a different perspective on how we connect with our loved ones… and that they just have the urge to hug their families after they watch. What were some challenges you had in bringing your vision to life? SEARCH is pretty unconventional in its format because everything unfolds entirely on computer screens. That unconventionality created challenges that permeated through every aspect of actually making the movie (especially the cinematography, post-production and more). But specifically, one of the biggest challenges was taking the screenplay whose slug-lines included things like “INT. GOOGLE CHROME – FACEBOOK” and coming up with a plan for creating the hundreds of assets it takes to make just one Facebook page look and feel real. It turned into a balance of first planning conventional live action scenes and then strategizing how to create assets for fictional social media pages within the same limited resources that most indie films have. Luckily we had an incredible team to put it together, including and especially the only two editors in the world that could have pulled this movie off. At the end of the day the process that made SEARCH so difficult was exactly what also made it so unique and fulfilling as a producer. There wasn’t a clear roadmap… so we became pioneers. What’s it like to have your project be in one of the world’s best known festivals? (If you’ve had a project (or projects) at Sundance before please mention that experience and say what it feels like to be selected again). I was lucky to be at Sundance in 2016 with a short I produced, JOIN THE CLUB, written and directed by Eva Vives – which is now a feature we just completed: ALL ABOUT NINA. I also had a film that I’d worked on as Production Manager that same year called the THE INTERVENTION, which premiered in US Competition (and by complete chance the short was programmed in front of the feature, so I got to premiere both projects at Eccles on the very same day!) This time around, as a Producer on SEARCH, it feels even more special. I’m looking forward to celebrating our film’s recognition with all of my film team members. A good sale would be nice of course, but I’m mostly excited to share our hard work with audiences (after 2+ years in the making) and see some great movies while we’re out there! How did your USC experience help you in creating this work? (For example, are there fellow USC alums/current students or professors who you regularly collaborate with or who have helped you? Is there a particular skill or experience from School that informs your creative process). Almost all our core members of this team (12 to be precise!) were USC grads. It’s a story about a family and it was made by a true Trojan Family. Many of us had worked together before, and for those of us who hadn’t, the trust was there right away. Of course the lessons we learned in our classes carried over, but the biggest gift SCA gave us was their incredible collaborators. So thank you big time USC!